Recently, a member of our team ran into a client request that posed a bit of a challenge. The client wanted to display employee pictures in Power BI reports using images saved in a database. But the image data was stored using a varbinary (max) data type column. The problem? Power BI can only display images if they are categorized as URLs, because the URL is a pointer to a location where the image exists as a file. The good news is that there are workarounds to this challenge. 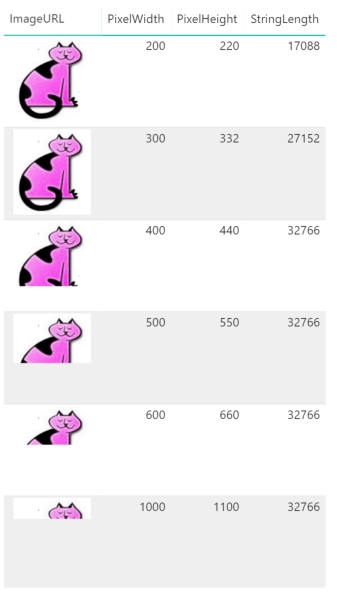 We are going to reconstruct the above use case and demonstrate how to pull in images from a local database, and then use custom columns in Power Query to reformat the source data in a way we can render graphically. Note: This same custom column technique can also be used to display images imported using a local folder as a data source. If you have Power BI Desktop installed, you can work through along with this post by downloading the .pbix file with this link. In our sample database we have a couple of tables containing images stored in a binary format, as well as a few columns of metadata for the images. The images being used here are a JPEG file type, but this technique can also be used for PNG files. We imported the data into Power BI and loaded two tables of images: Examples 1 and 2. 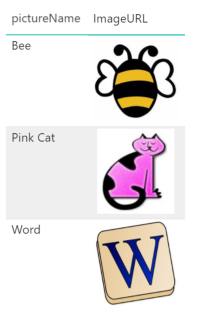 For the first example we used three small images in the table, as shown below. 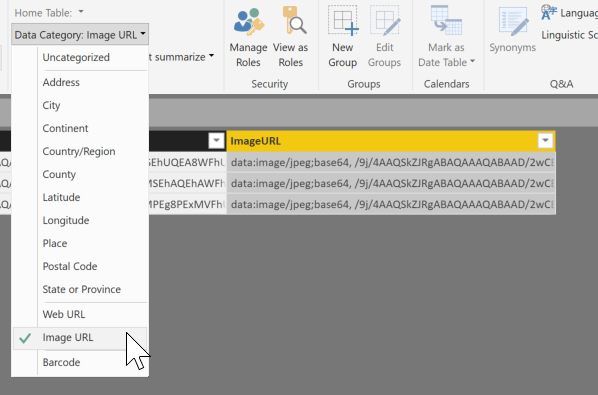 The final step is to set the Data Category of the ‘ImageURL’ column to “Image URL” so that Power BI will recognize it as a URL rather than regular text and display the image. 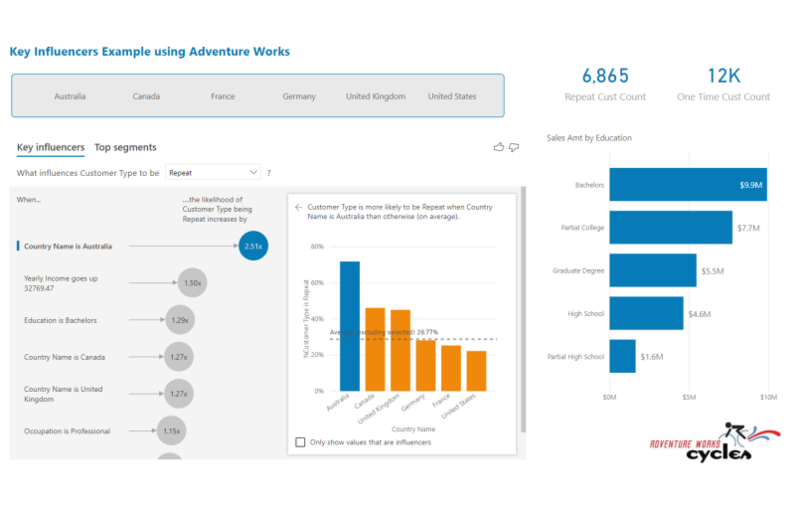 Now you can use those images in a Power BI report without worrying whether online graphics will result in broken links. There is one major limitation to using this technique and it stems from the string length allotment in Power BI. Power BI has a maximum string length of 32,766 characters. This causes issues when trying to embed large images. To demonstrate this limitation, I took the same image and replicated it multiple times adjusting the size of the image. For testing purposes, I also added pixel width and height measurements as well as the length of the ‘ImageUrl’ string as columns. As you can see from the picture below, the image starts to truncate once we get to the 400x440 pixel image. As you move down the list and add larger images, more and more of the image gets truncated even though the image within the report stays the same size. Note the string length for the images, and how after the second image, all of the lengths say 32,766. The string for the image is being cut off at the 32,766-character limit. As of this writing there is no way around this issue. If you have the option, you can scale down images until they are under the limit and can be fully displayed. There are a few ways to work through these issues. Microsoft’s Jason Thomas also covered Power BI URL workarounds earlier this year using a different technique. 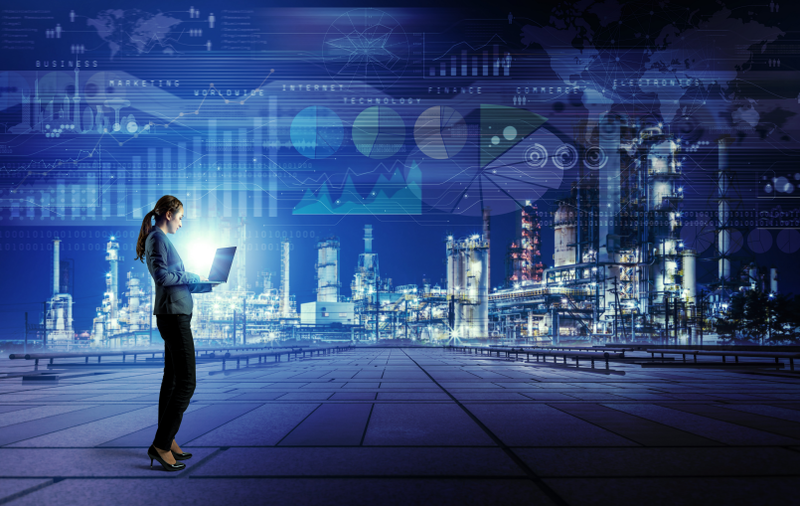 His method demonstrates how to embed images by using an external website to convert to Base64 Code, where this post focuses only within Power BI. You can read more about Jason’s method here. 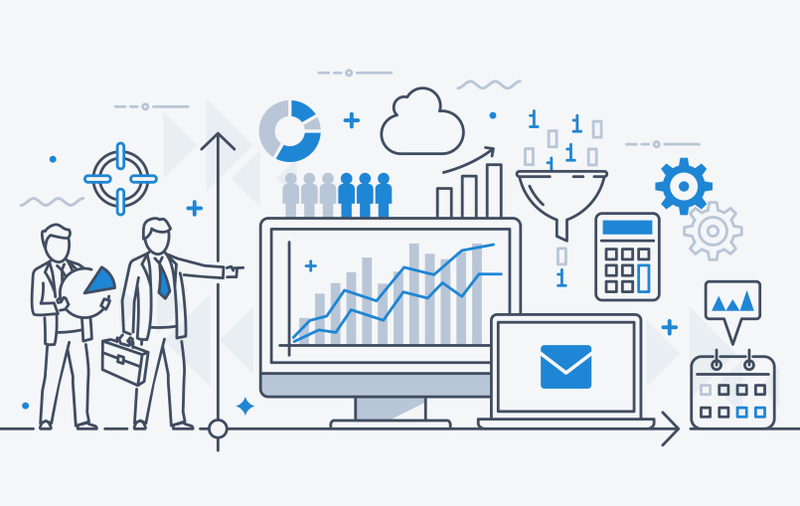 For those looking to master Power BI’s many capabilities, consider checking out BlueGranite’s free eBook on implementing a self-service BI program. 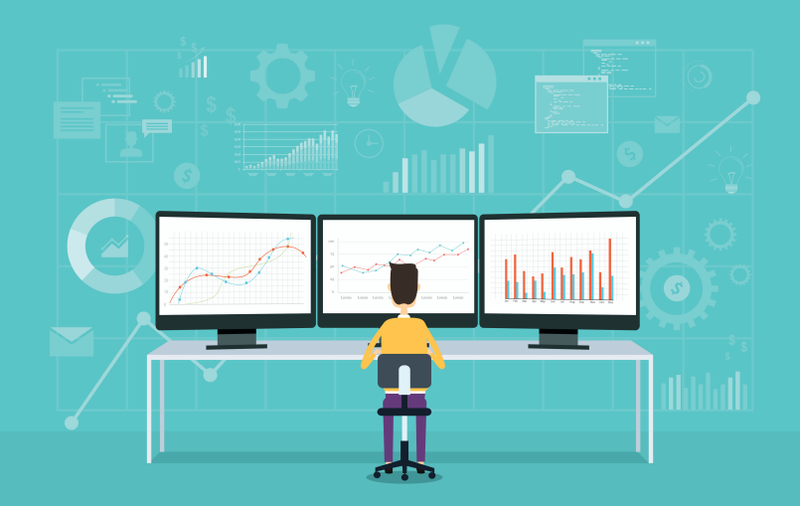 If you need further assistance, we help teams master the platform to quickly build stunning visualizations and share valuable data insights. Contact us today to learn more. Zach is a Staff Consultant at BlueGranite. 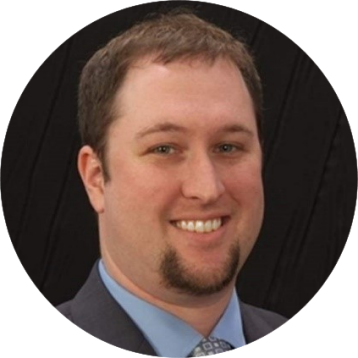 His areas of expertise include SQL Server Development, database development, dashboard report development, and data integration. Additionally, Zach received his Bachelor of Business Administration from Western Michigan University and spent time working as a paramedic in the southwest Michigan area.